I’ll be honest with you; I thought Deep Rock Galactic had a great early access launch. The gameplay was fun, it ran well and there was a fair amount to get stuck in to. But it’s still worth checking in to see how the game has progressed since its release earlier this year. Early Access games tend to get a lot of flak in the general gaming public eye and in some cases that flak can be justified, but there are developers out there who are producing great games, Ghost Ship Games is one such company. I recently did a stream where I jumped back in after not playing for a little while just to see what had changed. If you don’t know Deep Rock Galactic is a cooperative FPS where you take on the role of dwarves who are employed to mine rich resources from dangerous planets in deep caves full of aliens. There are four different roles you can choose from and each one has their own weapons and unique tools at their disposal. The gameplay can go from slow paced to frantic in the blink of an eye as swarms of alien bugs can descend on you from every angle. Tight claustrophobic tunnels and vast caverns hide all the riches you will ever need and your efforts to explore the procedurally generated underground will be greatly rewarded. I’ve been following the game’s progress fairly closely and have dipped in and out of it here and there to check out new things and just to have a bit of a mess around. 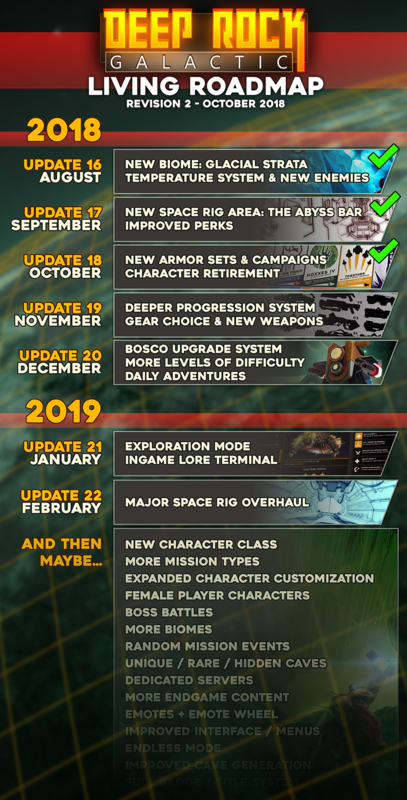 Since its release earlier this year there have been regular updates released adding new Biomes, new upgrades, a perks system, weapons, enemies, cosmetic items and a whole bunch of other stuff too. Communication from the developers has been consistent and good. The game currently has 90% overall positive score on steam which to me says they’re doing the right things during early access. Personally I think Deep Rock Galactic is one of the better co-op shooters out there, the gameplay is great fun and if all my friends owned it too I could actually see us playing it quite a lot. You can play the game solo although it does make it a lot more challenging, but they are working on ways to improve it as a solo experience too. Most of your entertainment will come from playing with others. On steam the player base peaks at around 800 per day with lows of around 350 which is plenty of people to find a game with others. I’m not sure on the numbers of Xbox however, but I get the impression that it’s just as popular. I’ve never had any issues finding people to play with and there are usually lots who are willing to exchange in friendly conversation. But even if people aren’t feeling chatty, voice comms aren’t needed to be able to succeed, you can still get the missions done whilst silently digging away. For £18 it’s a good price, but if that’s a little too steep for you and an early access game then you can wait for a sale as it usually drops to around £15. But personally I think £18 is worth it. If you enjoy playing co-op shooters then I can’t really see any reason why you wouldn’t enjoy Deep Rock Galactic. There’s 10s of hours of content to enjoy, fun gameplay, you easily play with friends of strangers. The development of the game over the last 6-8 months is a great example of how early access should be done and shows that the team are dedicated to making it a great overall experience as they move towards a full release which they state could still be a full year away. It’s a worthwhile investment indeed!